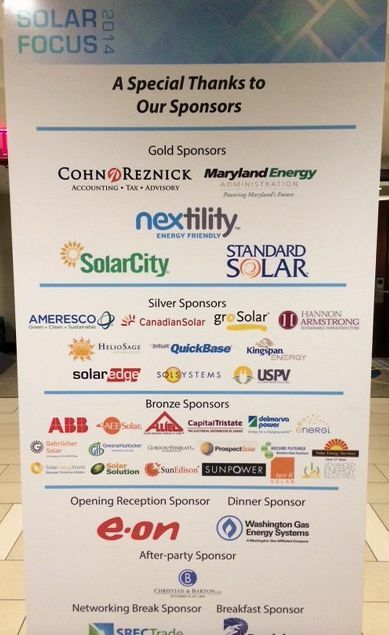 We’ve just returned from Solar Focus 2014, the big Maryland-District of Columbia-Virginia (MDV) Solar Energy Industry Association conference in Washington, D.C. and our client Secure Futures, LLC, was recognized as Solar Innovation of the Year. This is no small feat, and we offer congratulations to Tony Smith, president, and his management team who “brought to market a new concept, innovation, or product that promises to help advance the solar industry”, according to the award criteria. Secure Futures is a solar development company headquartered in Staunton, VA. They combine state-of–the-art solar technology with an innovative business model to make commercial scale solar readily affordable in Virginia. We’ve been their business counsel since before we formed the law firm, providing commercial and regulatory advice for its solar generation development projects. Another piece of good news, as far as we’re concerned, is the group of great companies we were among as sponsors of the conference. 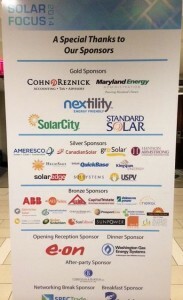 Take a look at the banner that greeted the attendees and you can see a lot of industry heavyweights joined us to support the meeting. We’ll be sharing more about Solar Focus 2014 in the weeks ahead, as we digest the material from the meetings we attended and moderated. If you have questions about the conference or any solar energy issue in Virginia. Maryland or DC, just give Leeron Molloy or Eric Hurlocker a call.